Feed your cat a raw diet high in taurine to keep him healthy. Your cat can leap tall buildings, chase his own tail, even catch an occasional mouse, but he can't synthesize his own taurine, an essential amino acid that all kitties need for proper nourishment. That's where you come in. Because your kitty cannot create his own taurine from other amino acid building blocks, he must receive it regularly in his diet. Too little taurine can cause dilated cardiomyophathy, which may weaken the heart's lining and lead to heart failure. 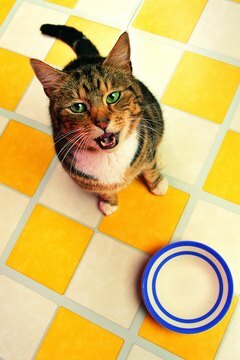 A lack of taurine in your cat's diet also may contribute to tooth decay and blindness caused by retinal degeneration. The typical cat (if there is such a thing) needs about 1000 mg of taurine for every 2.2 pounds of food, or roughly 100 mg per day. There's a reason your kitty is not a vegetarian. Vegetables contain almost no measurable amounts of taurine. There's also a reason your cat prefers raw meat sources over cooked ones. It's because cooking destroys up to 2/3 of the taurine content in foods. So trust your kitty's appetite, and feed him a raw food diet of beef, lamb, chicken, fish, or shrimp. You also can add small amounts (1/2 teaspoon per serving) of nutritional yeast to your cat's diet to supplement his taurine intake if he is a particularly finicky eater. Feed your cat a variety of foods to keep him from getting bored and to ensure that he receives the nutrition he needs in his raw diet. A 1 oz portion of turkey leg contains about 86 mg of taurine and is a good source of protein, as well. A 1 oz beef heart contains roughly the same amount of protein (8 g), but has only 19 mg of taurine. A 2 oz portion of chicken neck contains the same 8 g of protein and has 33.1 g of taurine. An ounce of canned salmon has 34 g of taurine, but offers less than 7 g of protein. Because taurine is processed easily through the kidneys and passes out of your cat's system quickly, you do not have to worry about overfeeding your cat taurine-rich foods. Grinding your cat's raw foods may make them easier to serve, but it also can reduce the amount of taurine content in the meat. This happens because the amino acids are exposed to bacteria that break them down and reduce their potency. 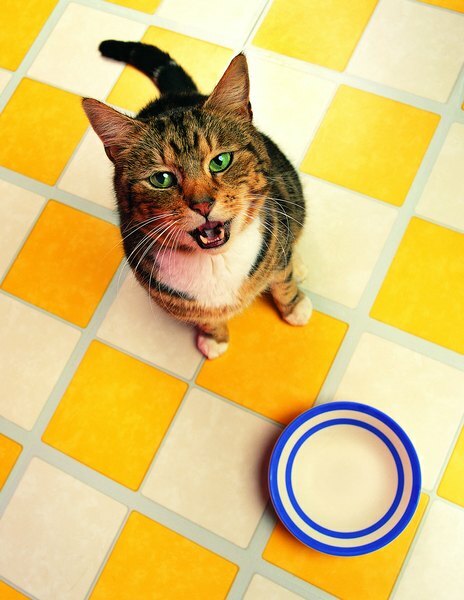 If you're not willing to slap a hunk of turkey leg or chicken gizzards into your cat's bowl, you should supplement his ground food diet with taurine capsules or powder to ensure optimum taurine absorption. What Is the Purpose of Grinding a Cat's Nails?